Rolson Crosspoint PH0 x 75mm - PH1 x 100mm PH2 x 38mm - PH2 x 100mm PH3 x 150mm. 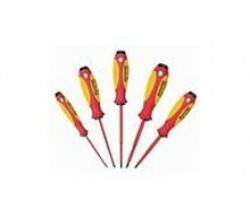 Sl..
12 Interchangeable IEC screwdriver blades with 2 component handle in sturdy smart box. Every screwd..
Set Includes: 5.5 x 100mm 6.5 x 125mm 8 x 150mm PH2 x 100mm PH3 x 150mm Handle manufactured ..
Screwdrivers blades are ice hardened for excellent durability. Using a MAXXPRO stainless screwdrive..
Witte Protop. PH1 x 80mm - PH2 x 100mm 2.5 x 75mm - 4.0 x 100mm 5.5 x 125mm - 6.5 x 150mm..
Witte MAXXPRO. PH1 x 80mm - PH2 x 100mm 2.5 x 75mm - 4.0 x 100mm 5.5 x 125mm - 6.5 x 150mm..
Set Includes: 1.5 x 60mm 2 x 60mm 2.5 x 60mm 3 x 60mm PH 00 x 60mm PH 0 x 60mm Freely rotat..
Set Includes: TX6 x 60mm TX7 x 60mm TX8 x 60mm TX9 x 60mm AK1.5 x 60mm AK2 x 60mm Freely ro..
2 Component Screwdriver Set. Handle made from PP/TPE Material, Blade made from Molybdenum Vanadium S..
Set Includes: 10 x Blades - 2.5 x 0.4, 3 x 0.5, 3.5 x 0.6, 4 x 0.8, 5.5 x 1, 6.5 x 1.2, PH1, PH2, P.. The handle that adapts to the users hand. Spanner Compatible. Screw symbols on handle cap Set I..
Ergonic, the first handle that adapts to the user's hand. Smooth, seamless handle for maximum comfo..
Soft grip handles Cgrome vavadium shafts & tips Fully insulated Sizes included Slotted: 2.5x75, ..
Set Includes: 2.5 x 75mm 3 x 100mm 3.5 x 100mm 4 x 100mm 5.5 x 125mm PH1 x 80mm PH2 x 100mm..
12x Screwdrivers Slotted: 6 x 38mm, 3 x 75mm, 5 x 100mm, 6 x 150mm, 8 x 150mm Phillips: PH2 x ..
Telescopic depot for 7 bits Ergonomically refined handle design for highest comfort and heavy duty ..
VDE tested to 10, 000 V and guaranteed to 1,000 V. Premium quality steel with molydenum and vanad.. Smooth, semaless handle for maximum confort. Hand and handle interlock, causing less strain Ergoni..
AC 100V Smooth, semaless handle for maximum confort. Hand and handle interlock, causing less stra..
AC 1000V Smooth, semaless handle for maximum confort. Hand and handle interlock, causing less stra..
Chrome vanadium steel 25 & 50mm phillips, slotted & security bits 50mm pzd & torx bits Socket siz.. The Bahco BAH808050S22 is a compact 22-piece stubby ratchet screwdriver set. The set is ideal for al..
Set Includes: 9.5 x 200mm - 16mm Hex 8 x 150mm - 14mm Hex 6 x 100mm - 13mm Hex 5 x 75mm - 11mm H.. Contents: (51-pieces) 1/4" 50 mm Power bits Tx: T5, T6 1/4" 50 mm Power bits Tx-S: T7, T8, T9, T10..